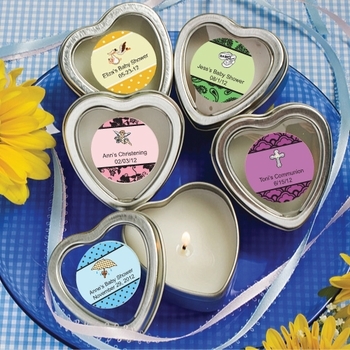 Light up your guest's faces with these custom heart shaped scented candles. Infused with a light sweet scent, they are just the right favor for many occasions, including Baptisms, baby showers, Christenings and more! Every candle is 2 1/4 inches in diameter and 1 inch tall and has a silver metal base with a clear plastic top that enables you to view the white scented candle inside. Furthermore, the clear top is ready for you to apply your custom designed label. These will arrive to you bulk packed, along with your customized, self sticking labels for trouble free attachment. Note - Assembly required: You apply stickers to each candle. For the custom labels, you can select from many colors, graphic designs and titles to add your own special touch to these beautiful candle favors!